China may well be able to find balance for its economy. But it will be a long transition process. Since Wen Jiabao took over as China’s premier in 2003, one of his main objectives was to make China less dependent on capricious export markets. The economic crisis of 2007-2008 dramatically exposed the perils of export-led growth, as dozens of cargo vessels had to moor outside the port of Shenzhen in anticipation of new orders from the West and thousands of factory workers were sent home. Ever since, the government showed itself even more earnest in rebalancing growth. Program after program was launched to stimulate domestic consumption and curb overcapacity. It was therefore with great relief that Beijing could announce subsequent drops in the current account surplus. At last, China was inching towards economic graduation. This trend shouldn’t be surprising. The investment in factory infrastructure has also grown tenfold between 2001 and 2010, reaching $900 billion a year ago. This is still much more than the $695 billion that was sunk into the real estate market. This investment boom has occurred across all industries. Even in steel and textile, two sectors where the government wanted to rein in overcapacity, investment in new infrastructure trebled and quadrupled. Investments in the car and electronic industries grew tenfold. China turned thus increasingly into a catch-all market, with capacity exceeding domestic demand in virtually every singled niche – from basic T-shirts to advanced electronics. Even in the car business, where domestic demand used to be bigger than supply, China has ramped up its production capacity now to a degree that it must export to survive. 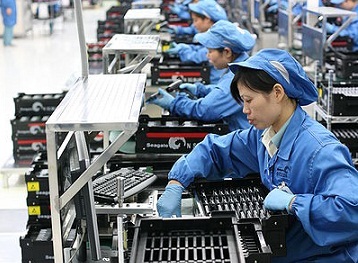 Export-driven manufacturing remains crucial for China. In the last five years, the trade surplus on manufactured goods on average represented ten percent of China’s GDP, compared to only four percent in the five years before. In the end, all this is symptomatic for industrializing nations and it will still take a long time for China before growing domestic consumption levels this unbalanced growth. During my latest visits to Beijing, most advisors and officials at the State Council and the National Development and Reform Council seemed to expect this maturation process to take another decade or two. There is indeed no reason to believe that China can’t reach a more balanced economy, but a lengthy transition is inevitable, a transition in which distortions will probably become much worse before they get any better, a transition also in which China’s ideal of win-win cooperation will increasingly be at loggerheads with economic reality. The fact is that China is inflating manufacturing to a degree that other nations will no longer be prepared to bear the deficits. That China’s economy is unbalanced is widely recognized. So why aren’t its policy makers doing more to fix it? Li Keqiang and Green GrowthChina's Real Estate MisstepThoughts on China's 5-Year PlanChallenges for the US-China Trade War ‘Truce‘How Do Chinese Netizens View the US-China Trade War?